If you’re like many students, you’ve probably noticed that some of the courses out there are better than others—to put it nicely. Picking an online course is tough—especially in the design and technology industries where there are so many options. The rise of online course platforms has given experts of all kinds new opportunities to teach online, and that only sounds like a good thing for learners everywhere. But the problem is that just because anyone can launch an online course or you can access hundreds or even thousands of courses by paying a small subscription doesn’t mean all of these courses are good quality. As with all facets of the web, giving a voice to someone doesn’t necessarily mean they’re worth listening to. Many online courses really are downright bad and will not teach you any more than Wikipedia. This is because being an expert in something doesn’t necessarily mean you know how to teach it. And, worse, there are some online course instructors masquerading as experts when it’s easy to tell they aren’t after a little research. A famous phrase that is too often true. However, even when course instructors truly are experts, they often don’t know how to teach. Experts who lack experience teaching often make the mistake of moving too quickly—they don’t remember what it’s like to be a beginner, so they often skip important, basic concepts. It turns out, teaching higher order skills like design, programming, and problem solving is surprisingly difficult. Inexperienced instructors (even if they are experts in their fields) are rarely familiar with effective instruction techniques for higher order skills. The popularity of the online course format has led many course authors to simply follow the format options available in their course platform of choice rather than creating content around specific learning objectives. So there are many reasons an online course might not be worth your time. While writing my own course, I worked with professional instructional designers and researched the most effective online learning strategies. I wanted to share some of that research with you, so you understand a bit more about how great courses are made (regardless of whether you’re interested in my course). Here’s a guide to help you evaluate online courses based on my instructional design research. As a student, this knowledge will equip you to find the online courses that help you learn most efficiently—especially for advanced skills like design and coding. Methods exist for teaching higher order skills like problem solving, design, creativity, and troubleshooting. Learning about those instruction methods will help you discern whether an online course will actually help you learn. Here’s a quick primer in the latest instructional research. Bloom’s Revised Taxonomy, taken from my free design bootcamp, Objective Creative. 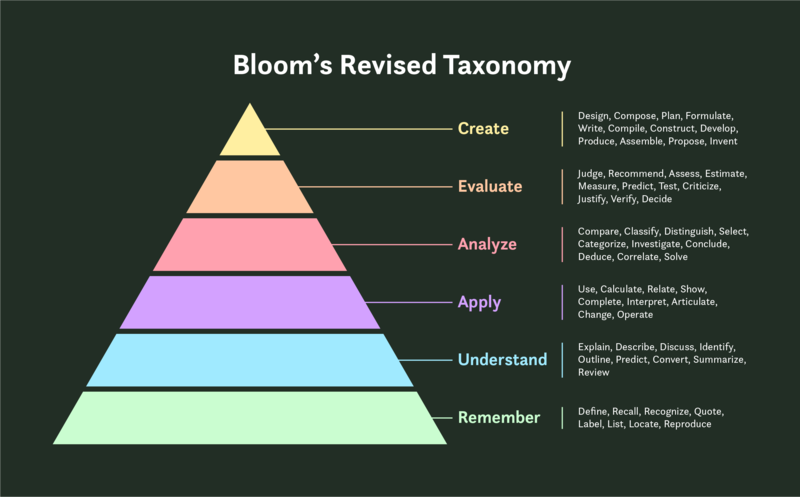 Bloom’s Revised Taxonomy separates advanced skills into phases of learning and matches those phases with instructional techniques. Professional instructors use it as a guide for teaching more challenging skills like problem solving. Whereas gaining knowledge or performing simple tasks (like changing a tire) are simpler to teach, teaching advanced skills skills requires more advanced instructional methods. This is pretty dry stuff, but it’s important because many online courses claim to teach advanced skills but use none of the methods that are most effective to do so. If you look at the list of verbs in the rightmost column for each phase in the diagram above, you might realize that many online courses only use techniques for the “Remember” and “Understand” phases. If a course claims to teach higher order skills like design, programming, problem solving, etc, but doesn’t use the methods associated with the higher phases of learning, you might have spotted a bad course. Applying: using concepts quickly after learning them increases comprehension and skill gain. Analyzing: analyzing how others solve problems and observing experts solving problems. Evaluating: reviewing your own work, getting feedback. So, while you’re looking for a course, here’s how to tell if a course does a good job of using those methods. Acquiring data is only the first part of learning. If you want to become a top designer or coder, you can’t just memorize terms. You need to form a process for solving problems and toolbox of techniques you use to react to a variety of challenges. Many students are desperate for feedback from experts because they don’t understand how to work on their own. But the solution they really need isn’t necessarily feedback—it’s the opportunity to analyze how experts work. Obviously many courses include screencasts where you can watch someone design or code, but the issue is that they don’t show problem solving. Many courses contain step-by-step tutorials that show how to accomplish a task rather than demonstrating a problem being solved from start to finish. For a course to teach you to Analyze properly, the lessons need to show how a problem is solved, including the reasoning behind each step. This is called modeling. Last, even if the course does include real problem solving demonstrations, you need to make sure the instructor is actually an expert! Before you buy a course, research the course author. This is a critical step for finding a quality online course. Look up their website and work experience (And yes, even their LinkedIn profile). Are they really an expert? If they don’t have an online presence or clear work examples, it’s unlikely they will have sufficient expertise to teach you. Does the course provide the right kind of feedback on student work? Not all feedback is healthy. In fact, some feedback can do more harm than good. Too often, feedback is directed at the person rather than the work. This is unfortunately very common in the design industry where surviving harsh critique sessions is a rite of passage. And again, just because someone is an expert doesn’t mean they know how to give the right kind of feedback. Teaching and providing feedback are separate skills from the core subject matter. Another common issue with online courses is that students want feedback from top experts, but hiring people who are at the top of their field to provide feedback isn’t cost effective for course creators or scalable for experts making their own courses. So, many online courses provide feedback from junior staff while supplying the expert as a kind of figurehead who is rarely directly involved. You’re paying for access to an expert but you don’t get nearly as much access as much as you expect. So, if a course claims to provide instructor-led sessions, Skype calls, and other personal interactions—make sure you verify who you’ll actually be talking to. However, getting feedback from your course instructor might not even be necessary. There are many worthwhile sources of feedback, not just from experts—so, even if expert guidance sounds attractive, you might not really need it. According to learning research, the core value of feedback is that it helps the student understand their progress. (e-Learning and the Science of Instruction, page 258.) For example, for designers, a critique session helps you know how much you’ve grown and which design principles you need to pay more attention to. However, there are many ways to get feedback that helps you understand whether you have made progress—it doesn’t necessarily need to come from an expert instructor. For example, for a designer no feedback is more indicative of progress than a client’s feedback. Similarly, peers are a great source of effective feedback. They understand the goals and context, and they can provide an objective measure of progress. In my own online course, I chose to emphasize peer feedback and accountability groups. This gives students an objective view or their progress and accountability to keep working. I found this to be a better fit for my students, who often struggle to practice their design skills; they need motivation and accountability for practicing more than they need feedback. And when they need feedback, peer reviews are effective. This structure also makes my course more affordable than if I were running live critiques and sessions. You’ll notice that online courses with live meetings and sessions tend to be more expensive, and it’s true that some learners do benefit from them. However, remember that there are many ways to get feedback on your work without buying into those formats. Finding the best course for you requires comparing these approaches to how you learn best. The third area many online courses neglect is “Creating”, or encouraging students to practice using what they’ve learned. Research shows that practice is the main differentiator of elite performers. (e-Learning and the Science of Instruction, page 259.) The best violinists in the world, for example, tend to practice many more hours per day than their less accomplished peers. This holds true in all skills, not just music. So, the best online courses encourage practice. Practicing using concepts immediately after learning them. Steady, consistent practice over the long term. Many coding bootcamps encourage relentless practice—and practice is a good thing. But not everyone wants to give up their life for 4-6 months to practice 70 hours/week before they see results. That format is planned around short-term gains and not long-term success. Clearly, no one can continue at such a pace forever, so it’s not a long-term learning method. Instead, students need to learn healthy habits for practicing regularly. However, there is an issue when it comes to practice: practicing is hard, so students don’t want to do it. So you also need to find a course that motivates you somehow. What motivates you to learn and practice is a very personal thing. You might prefer buying a course that’s taught by someone you respect, or that has an example project that excites you. Or, you could buy a course that includes some sort of accountability (like accountability groups, 1-on-1 instructor sessions, course schedules, etc). Whatever it is, pick a course that is exciting and that motivates you to keep practicing what you learn, because when you finish reading the lessons and watching the videos, it might seem like you’re done learning, but the truth is, you’ve only begun. Find a course that keeps you engaged and practicing. Take my free design bootcamp, Objective Creative. 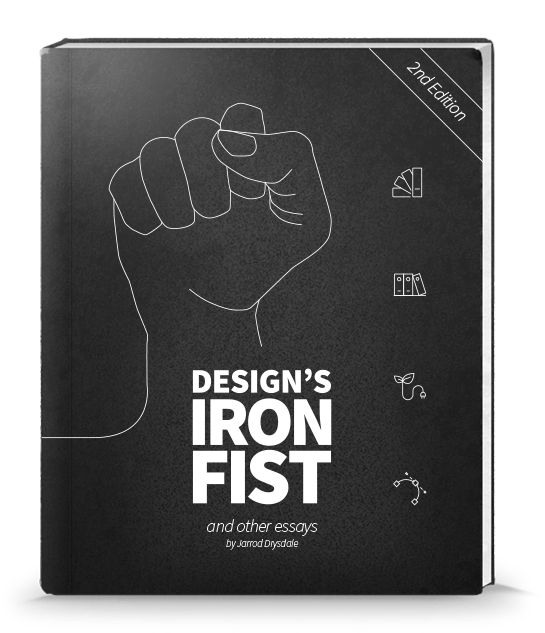 Lessons 6 & 7 teach the best methods for learning design and developing the creative process. Zen Courses, a podcast about online courses by Janelle Allen is excellent. If you’re writing a course, check out the textbook “E-Learning and the Science of Instruction” by Ruth Colvin Clark and Richard E Mayer, which I refer to often in this article. Hiring an instructional designer is a great investment. If you haven’t heard of instructional design, this is a totally separate profession from UX/Web/graphic design. Instructional designers are professional educators and often specialize in online learning.